How do we know that the Bible isn't just a fairy tale? 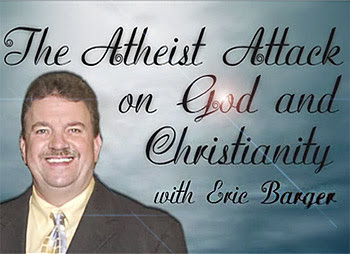 Nathan Jones: So far, Eric, we've been talking about Atheist attacks on God. Let's shift over to Atheist attacks on the Bible. They believe the Bible was just made up and is full of fairy tales reflecting only man's search for God. How do you respond to that? Eric Barger: The Bible is the best kept, longest kept record in the history of mankind. The Old Testament kept by the Jews was recorded with super accuracy, to the point if they changed one jot or tittle, those are King James words meaning one apostrophe or one comma, it was off with your job if you were a scribe. Remember that the Bible isn't just one book, but it's 66 different books written by about 40 different individuals over about a 1500 year period of time. After reading all of the other religious writings in the world like with the Bhagavad-Gita and the Qu'ran and the writings of Buddha which are based originally on Hinduism, you'll see that the Bible is the only book that so perfectly harmonizes together. God has a supernatural stamp or handprint upon the pages. To me this harmony is one of the greatest refutations of Atheism and Evolution, because the Bible so clearly harmonizes together. The Bible stands alone apart from all the other religious writings, yet it isn't even just one book. As we discuss with our friends and family, they should always remember the Bible is a compilation of teachings put together into one binding for today, but written by different authors that by harmony verify there is a God. Nathan Jones: What is that unifying theme of the Bible that combines it all together? Eric Barger: I think Bible prophecy. Once again we come back to the hundreds of fulfilled prophecies in the Scriptures. God has impressed upon particular people to write down various parts of the puzzle that He has put together for us to understand. Nathan Jones: Fulfilled prophecy is indeed a proof for the origins of the Bible coming from God, but I'm also curious about the theme. Overall, what is the theme that combines all 66 books together? Eric Barger: There is a God who loves us and who wants to have fellowship with us. Mankind was created to have fellowship with God. Dr. Reagan: Another proof of the Bible's divine origin came to mind while you were talking and that is the impact of the Bible on lives. Take a guy like Jack Hollingsworth who is the featured singer on our program "Christ in Prophecy." He lived on the streets homeless for 20 years as a deranged alcoholic. Then, suddenly, he meets Jesus Christ and his life was totally changed. Another example is the fellow who wrote the song "Amazing Grace." He was a captain of a slave ship, and yet his life totally changed when he was saved. All through history, the Bible has totally changed people's lives as a result of them reading the Word of God and coming into contact with Jesus Christ. Eric Barger: My testimony is right in line with those transformations. I was raised in a church home and never lived for God. I got into drugs and alcohol and the New Age Movement and was totally lost. When I finally did come in contact with Jesus Christ, I found total and complete deliverance. God then called me into ministry pretty quickly. It's a long story, but I'm one of those guys, too. I know what reading the Bible can do to a lost soul. Dr. Reagan: I praise God for the transformation! In the fifth and last segment on why Atheists think the way they do, we'll challenge the Atheist's claim that the Bible is full of contradictions that disprove its validity.